if HAIO achieved the goal, how do you think they will reward their shareholders? Will it proposed SPECIAL Dividend (BONUS share issue) to reward their shareholders? Will HAIO continue Share Buy Back? How many % ? Let's move on to review their dividend payout. HAIO do have dividend payout policy. 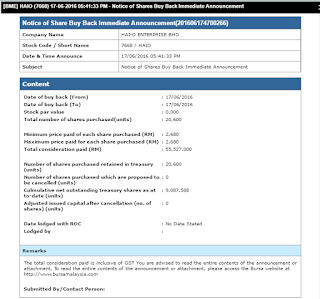 According pass dividend history, HAIO do distribute treasury share as Bonus Issue. Although it might be too early to predict, this round what's Treasury Share used for. No doubt, it have been quite sometimes, HAIO never distribute bonus share to shareholders. 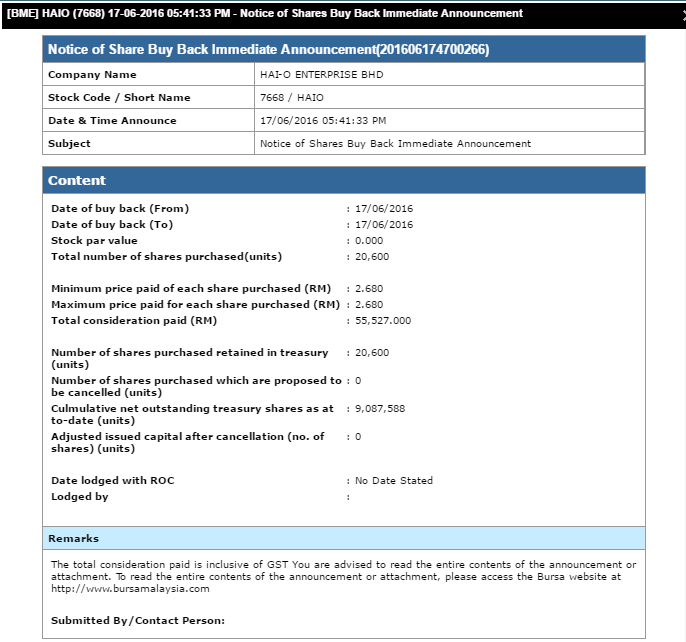 So it's high probability, this round Treasury Share will be distribute as bonus issue. Lets watch closely HAIO for opportunity. This article is for sharing purpose only. Please consult your legal investment agent/broker for trading advice.